A gazetteer of the Free City of Greyhawk and the surrounding area. 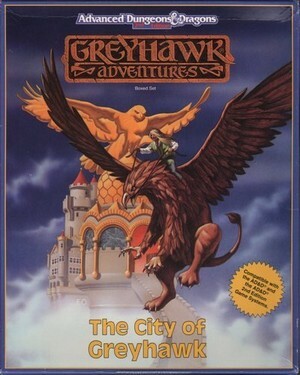 The city beckons, Greyhawk, grandest jewel of the Flanaess, awaits you, offering adventures to stagger your imagination, tresure beyond your wildest dreams - and of course, dangers aplenty. 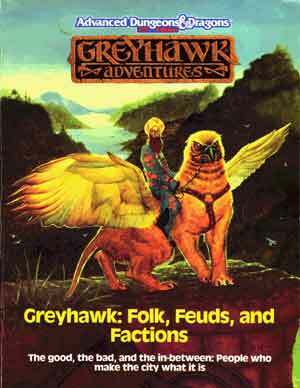 Greyhawk — City of High Culture and Low Life ! From the high towers of its grand universities to the rancid alleys of its darkest slums, the City of Greyhawk awaits you. 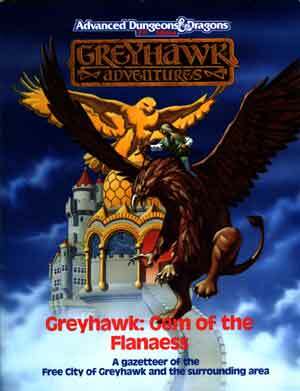 Center of magic and learning in the Flanaess, Greyhawk is also the home of powerful thieves, mighty warriors, traitorous ambassadors, and honest craftsmen. They all await you within the pages of this information- packed boxed set. You get four full-size, full-color maps, each depicting a different aspect of the Greyhawk campaign. Two 96-page books give you a detailed overview of the city and a closer look at its more influential citizens— and it more notorious criminals. Many detailed, colorful adventure cards provide players with short adventures in the city and throughout the surrounding realms of Greyhawk. "The good, the bad, and the in-between : People who make the city what it is"
This book details life in the Free City ; politics, trade, society, law, the learned and cultured, the low and shady, the entertainments and festivals and sights of the city.